Konni Burton, candidate for Texas Senate District 10 was today endorsed by a host of Tarrant County GOP area leaders. These leaders are tasked with precinct chair organization and ground work for Republican candidates during elections. The endorsement of Konni by these area leaders show her continued grassroots dominance in the race to become the Republican nominee for SD 10. 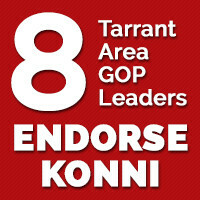 A full listing of area leaders endorsing Konni can be found below. Konni and her husband Phil reside in Colleyville and have two daughters. Tori is a Senior at Tarleton State University and Faith is a Senior at Grapevine High School. Konni and her family are active members of Calvary Lutheran Church in Richland Hills.